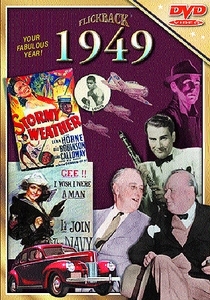 1949 DVD. What Happened in 1949. 70th Birthday Gifts.1949 gave birth to the North Atlantic Treaty Organization and your special someone! Find out what other memorable events happened in this most popular of 70th birthday gifts, our 1949 DVD! What more inspired of birthday ideas than to commemorate their big day by giving an extra special gift that evinces the world into which your distinguished person was born! Find out what the world news events were, who were the big newsmakers, what was happening in politics, sports, music and entertainment with exciting newsreel highlights! Lend insight to the world in which their parents were dealing as they welcomed their precious baby! Maybe baby�s first time being babysat was when their parents went to see �Sands of Iwo Jima� with John Wayne. Perhaps he or she was soothed to the sounds of Perry Como singing �Some Enchanted Evening� a chart topper in 1949! This scintillating 1949 DVD is a most welcomed 70th birthday idea! Also contains �On the Lite Side� Runs 30 minutes. See also our other 70th birthday gifts.